Heat oven to 375°F. 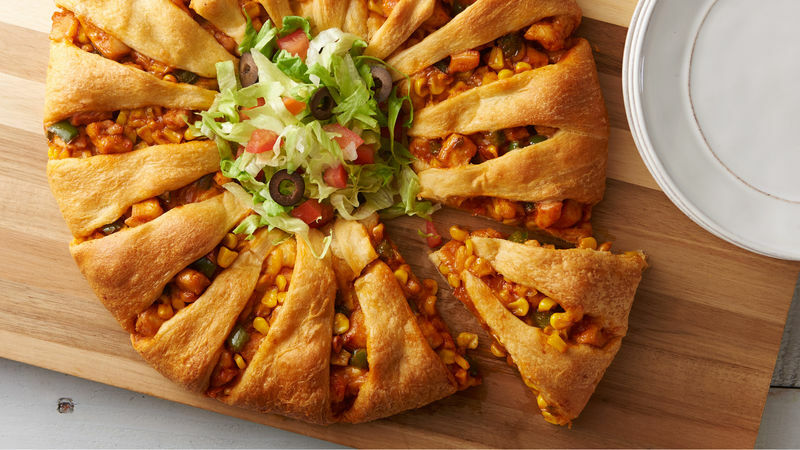 Spray 14-inch pizza pan or large baking sheet with nonstick cooking spray. Heat oil in medium skillet over medium heat until hot. Add chicken; cook 5 minutes or until no longer pink in centre, stirring frequently. Add corn, bell pepper, water and taco seasoning mix; mix well. Heat until bubbly. Reduce heat to medium; cook 10 to 15 minutes or until liquid evaporates, stirring occasionally. Remove from heat; stir in cheese. Set aside. Unroll both cans of dough; separate into 16 triangles. Arrange triangles on sprayed baking sheet with short sides of triangles toward centre, overlapping into wreath shape and leaving 5-inch round opening in centre. Lightly press short sides of dough to flatten slightly. Bake at 375°F. for 20 to 25 minutes or until golden brown. Meanwhile, in small bowl, combine lettuce, tomato and olives; toss gently to mix. Spoon lettuce mixture into centre of ring. Serve with sour cream and salsa.